The idea of Bike Winter is simple: with a little inspiration, education and determination, it’s easy to stay in the saddle year-round. Add in the camaraderie of hundreds of riders and dozens of exciting events and there’s no reason to put your bike in the basement when the temperature dips and snow starts to fall. 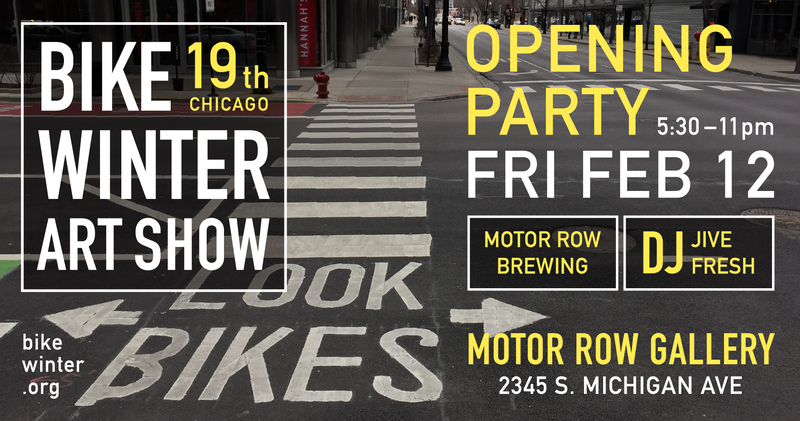 Opening party for the 19th Chicago Bike Winter Art Show is this Friday at Motor Row Gallery (2345 S. Michigan Ave.). We have another amazing line up of bike artists this year with over 50 works submitted. Motor Row Brewing will help break the ice with their newly released Frozen Pond Black Lager, and DJ Jivefresh will keep our feet moving and our hearts pumping. 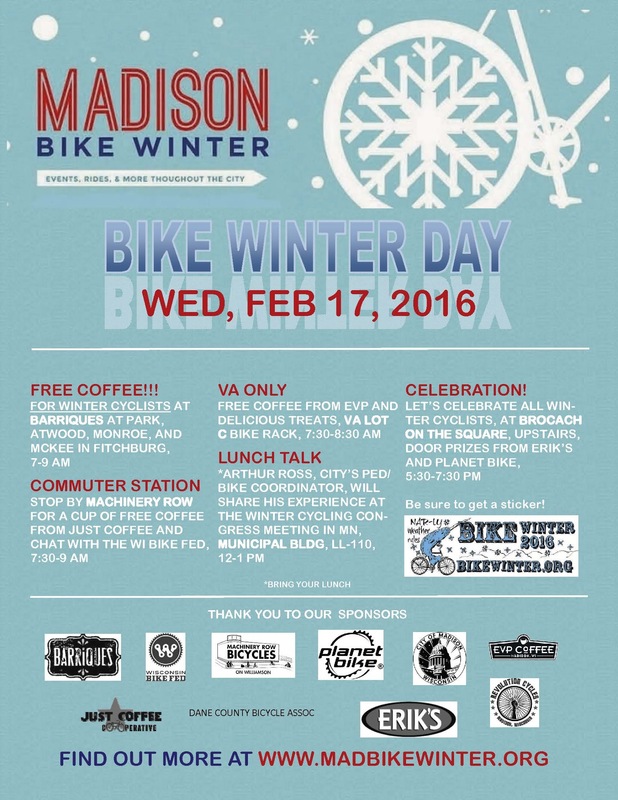 Free admission, thanks to Chicago Bike Winter for sponsoring the show! Thanks to Jason Greenberg for the 2016 Bike Winter sticker design and execution! Scroll down to the bottom of this page for instructions on how to get your stickers. We are pleased to introduce our 2013 Bike Winter blogger Katie, and look forward to seeiing how she adapts to the challenge of all-season cycling. Scroll down to "BICICLE BEGINNER" and click over to say "hi!" True to our usual fall tradition, we have been working to plump up the Bike Winter event calendar with events. Point your browser to http://bikewinter.org/events and pull up your city. At the bottom, there is an "Add an Event" link-- please be part of the Bike Winter effort and help out by adding anything and everything you are aware of, including and especially your own events, of interest to year-round cyclists in your area. Our target date for 2013 Bike Winter Sticker distribution was the big 15th Anniversary Chicago Critical Mass ride on September 28, and thanks to your help we passed out close to 1500 stickers! Thanks to unprecedented participation we had no less than 16 candidates for the final design. We are grateful to all who participated and hope to see some great designs updated and resubmitted for next year's competition. Congratulations to Allison Rose for the winning design! The colder months are an important time to make sure there's plenty of opportunity to break out of hibernation mode and enjoy the company of others, so think about what events you want to help organize. Are you crafty? Host a fleece cutting party to help with gator and balaclava production. On the sidebar to the left, there's a link to our list of events. Events will be added regularly, so check back often. And feel free to add your own! 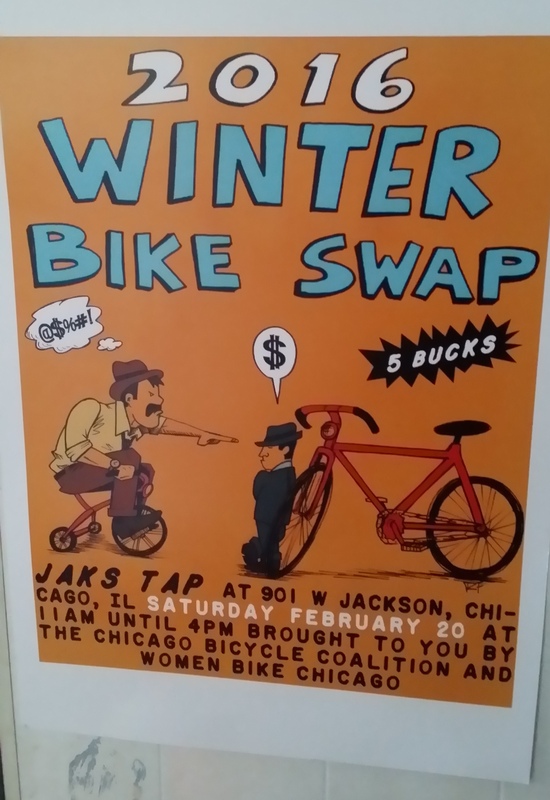 If you are in Chicago, get involved and stay in touch via the Bike Winter listserv, the BW Chainlink group, or by contacting us. People in Madison should check out their Facebook page. And feel free to help keep Bike Winter rolling via our Paypal donation page. We love this photo of Lorena Cupcake posted on The Chainlink by Archie from whateverland.com. Cheer beats chill! Meet our new blogger for the 2011-2012 season: Katie! Happy New Year - Bah Humbug! On any day when there is snowfall of two or more inches, meet us at the toasty warm Corner Bar at 7:00pm. Pre-warm your winter biking gear on the radiator. Departure is by 8pm; bring lights! On extra good evenings, the ride will be followed by sledding in Humboldt Park. Contact Pierogi John for details.